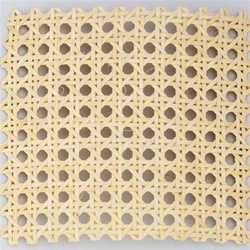 Cane webbing is pre-woven cane made by machine from strands of chair cane. It is primarily used for re-seating cane chairs that have a groove around the seat opening rather than drilled holes. 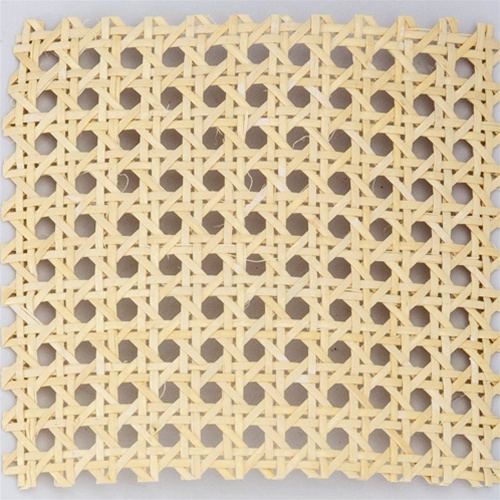 It is also used on cabinet doors. The cane webbing is held in place in the groove with the proper size spline and glue. We recommend our Canecraft glue. On cabinet doors the cane webbing can be glued and stapled to the back and then finished with a molding to cover the staples. After soaking the cane webbing in water for about 1 hour, line the cane webbing up straight on your chair or chair frame. Before pushing the cane into the groove, pull out the strands that are parallel to the groove up to the edge of the groove. This will help the cane from breaking and make it easier to push into the groove. To determine the size of webbing required measure from the outside edges of the groove at the widest part, front to back and side to side. For example: if your seat measures 15” x 16” form groove to groove then you should order a piece 17” long by 18” wide. We stock the cane webbing in 50’ rolls by various widths ranging from 12” to 48” Not all the patterns are available in all the widths. The available widths per pattern are listed under that particular pattern. If you are unsure of the cane webbing please send us a sample and we will match it. Instructions for installing the cane webbing will be included with your order.